Is Mexico City the next Miami? Is Art Basel Miami Beach over? Will Frieze Los Angeles burn Zona Maco? Fair questions, literally, for a restless art world always eager for the next new thing. These were among the issues under discussion in the run-up to this week’s string of art fairs, gallery openings, and private collection and museum visits anchored by Zona Maco, now in its 17th year. However it shakes out, Mexico City’s increasing prominence as a cultural seedbed — an inspiration for Oscar favorites like Alfonso Cuarón’s Roma — makes it a promising candidate to lead the next wave of art adventurism. One pre-Maco (or #premaco) indicator was the Groundhog Day (locally Tamale Day), VIP opening of Fraccionar, the latest group exhibition to intrude on the indisputably transcendent experience of Casa Luis Barragán. 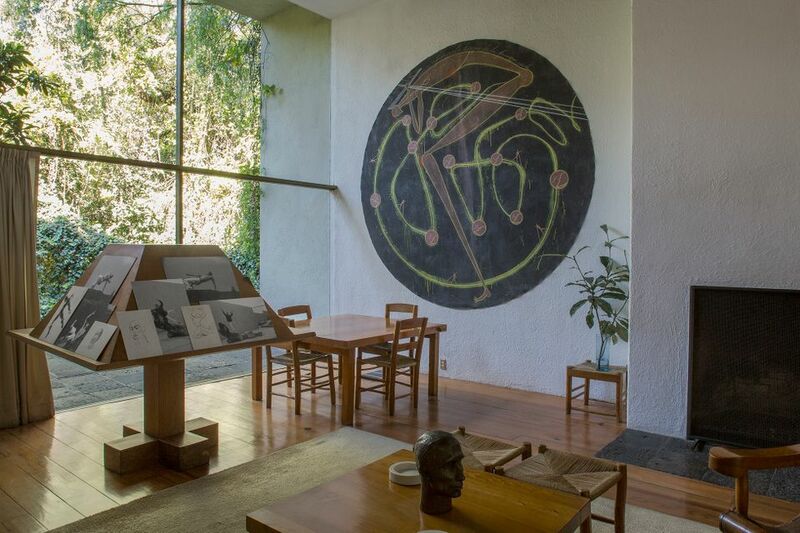 Organised by Inti Guerrero (the Hong Kong-based Estrellita B. Brodsky Adjunct Curator of Latin American Art for the Tate in London), Fraccionar is the current presentation of a programme initiated in 2016 by Monterrey’s Estancia FEMSA (a leading beverage company’s collection) and Casa Luis Barragán. Estancia FEMSA’s co-artistic director Eugenia Braniff was on hand with Guerrero to lead tours. (Only a few people at a time can enter the house.) Going in, I was wary. 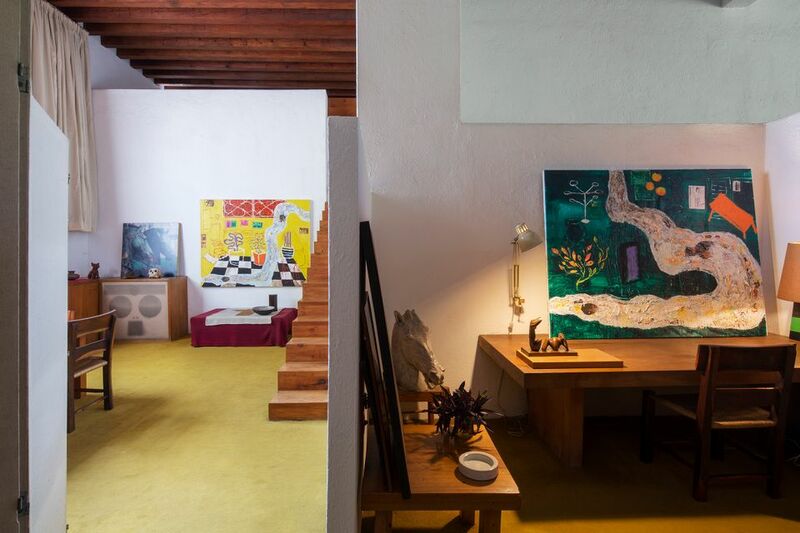 Such interventions into historical landmarks can be jarring, particularly at Barragán’s home, where the addition of contemporary works may call attention to the pristine architecture while simultaneously diminishing it. Barragán (1902-88) is Mexico’s answer to Le Corbusier. He’s a hero. To fool with the harmonies of his play of light, colour and shadow is risky business. So I’m happy to report that Guerrero has succeeded where others have fallen short. Sensitive to this environment, Guerrero chose an equally idiosyncratic selection of recent and historical works by 14 artists from half a dozen continents and hung them as if Barragán had placed them himself. So the intrusions felt like those of a welcome guest. One standout was a dreamlike, 1985 painting by Julio Galán, a flamboyant personality befriended by Andy Warhol (and shown last year in New York by Timothy Taylor Gallery). Its imposition on a wall in a guest room is not only appropriate to the space but enlivens its dominant Catholic imagery and objects, which seem equally surreal. 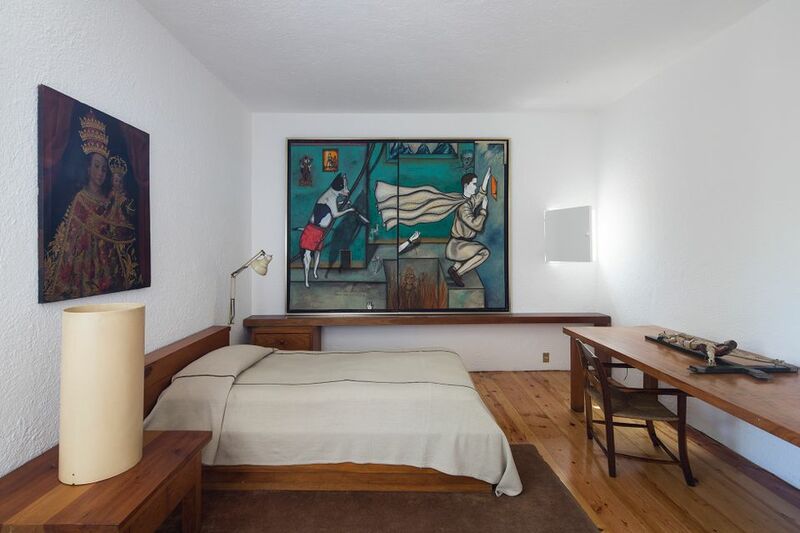 Black Christ, by Reyes, is almost frightening in both its effect on, and sympathy with, the architect’s super-austere bedroom. Colonialism, and its attendant cultural appropriations, is a constant issue among Latin American artists and Guerrero introduced it in several ways at once. The mix of folklore, popular culture, politics and religious ritual in two intriguing, narrative paintings by Gideon Appah, a 28-year-old Ghanian, fits right in. One even enhance the wall in a sitting room. So does a collaged tapestry by the New Zealander John Pule that presides over the dining room with a satiric, “South Pacific” video by the Berlin-based Ming Wong. Braniff accurately described another amusing video, by the Panamanian-American duo Donna Conlon and Jonathan Harker, as a “symphony of mangoes”. (Actually titled, Tropical Zincphony.) Projected on a large screen in Barragán’s studio, it choreographs a company of said mangoes as they bump and bang like a hard rain down a series of tin rooftops typical of shanty housing in Panama City. There was a lot more, some more sobering or meditative than others, but it all added up to an absorbing show that ultimately respected the house, its contents and its designer in unexpected ways. his one made for a bracing start.